Make your grand entrance unforgettable flaunting these glamorous Austrian Crystal dangle earrings by Mariell. Add endless sparkle to any wedding, prom, bridesmaid, pageant or special occasion with these gorgeous pierced statement earrings. Our top-selling rose gold chandelier earrings with blush pink crystals will deliver a serious dose of bling...at a super affordable price. At 2 1/8" h x 3/4" w, our bold pear-shaped crystal teardrop chandeliers will guarantee to turn heads as you dance the night away. 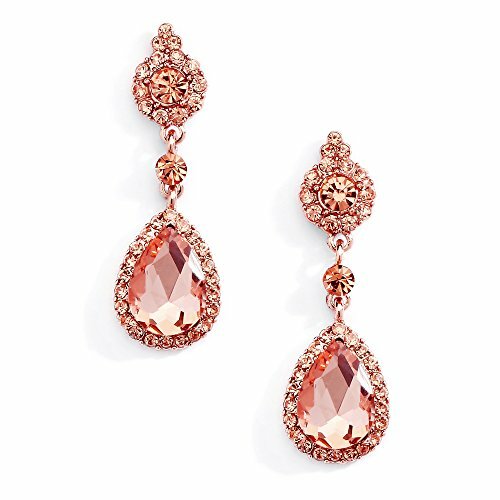 We promise you'll adore these dazzling crystal drop earrings or your Money-Back. Treat yourself or someone you love to celebrity style glamour at an irresistible low price! As always, enjoy Mariell's exclusive 100% Risk-Free Purchase and Lifetime Guarantee.